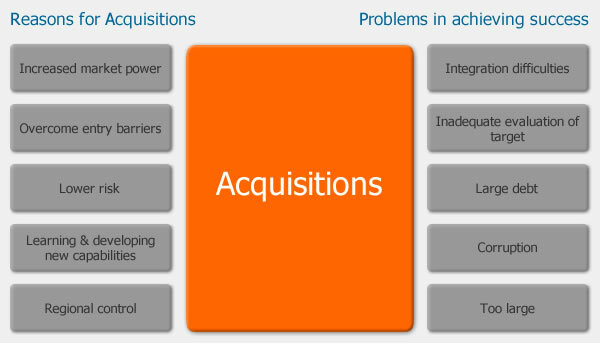 Mergers and acquisitions (M&As) are aspects of corporate strategy, finance and management involving the buying, selling and/or combining of two or more companies. The idea is to achieve rapid growth in a given industry without having to create another business entity1. Here, a distinction must be made between mergers on the one hand and acquisitions on the other. A merger between two organizations involves a decision by both parties to integrate their operations on an equal basis. An acquisition involves one organization buying a controlling interest in another and clearly establishing itself as the new owner2. The latter scenario can include hostile takeovers. Both M&As involve considerable financial, market and operational risk. 2. Viney H, Gleadle P. B820 Strategy, “Unit 5, Competitive and Corporate Strategy, session 5 (Corporate Strategy in Multi-Business Organisations),”Milton Keynes, UK: The Open University; 2003:p 87. 3. S. Michor (2008), Mergers, Acquisitions and Operational Risk, Regulatory Affairs Focus, RAPS. 4. Hitt et.al (2003a), Milton Keynes, UK: The Open University.